The primary drive side of a D14 Bantam engine. Monday and I took a trip over to Bikers Paradise in Coventry and dropped some leather gear in for repair. The main item was my leather flying helmet which was made for me back in the mid 1980's. They said they will let me know if it can be relined. Wednesday and Bikers Paradise phoned to say they could reline my helmet. 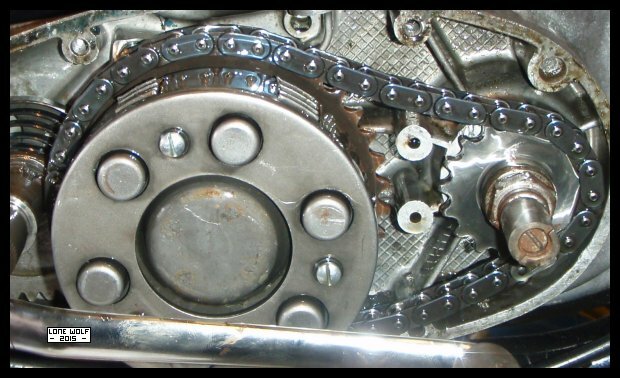 I spent quite a bit of time fettling the D14 - new sprockets back and front and a new chain. Oops, the split link pins are too long. Got in touch with "The Chain Man" and he will bung me some new ones in the post. Thursday and it was back over to Bikers Paradise to pick up my jacket ( relined ) my trousers (new pockets ) and my helmet (relined ) £153 for the lot. First job Friday was to go and pick up my B31 barrel and crankshaft. New big end bearing and a rebore to suit a 750 Bonnie piston. My split links arrived so I fitted the chain to the D14 - next problem, the clutch plates have stuck together due to the engine standing for a good while. The trick of starting it, putting it into gear and applying the back brake didn't work. Ah well, looks like the side of the engine is coming off then. Saturday and I took the Drifter to the off road show at Telford . . . .only for the "car park attendant" to tell me the bike park was full. disabled parking . . . which I was told was about half a mile up the road. Rather than argue, I turned and left. Can't you just tell this event is now run by Mortons Media ? Sunday was spent looking at the rain . . . . as opposed to going out in it.